I begin with a number no lower than 5, and that is how many things I will put on my gratitude list for the day. As I write something down on my list, I really spend a few moments thinking about that item and why I am grateful for it. I think about how having it in my life impacts me and how it would feel if I did not have it in my life. Then, I move on to the next item on my list. I do allow myself to repeat items sometimes because sometimes I am really ridiculously grateful for whatever it is. But, I don’t just add items to the list to have them on there, I fully immerse myself in the “why”. After my mom passed away, I decided that the best way to honor her and remember her was to #seekjoy #begrateful and #expressgratitude every day. While that hasn’t changed, I rarely post about it. After reading Bethany’s second installment, Practice Being Grateful Today (and Feel Better Too! 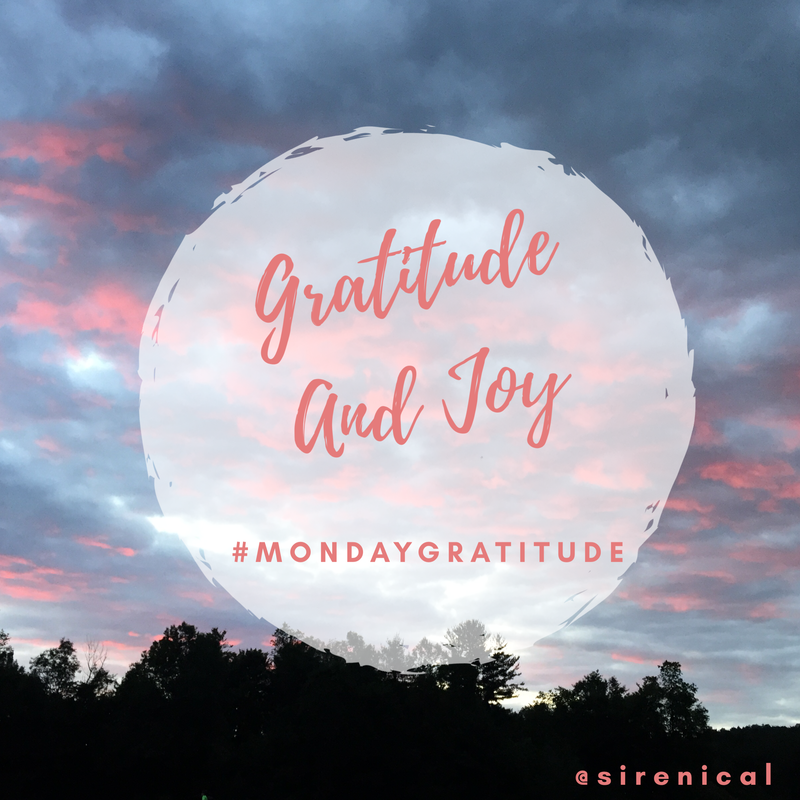 ), I decided to join her in the weekly #gratitude because we all have more to be grateful for than we realize and don’t spend nearly enough time expressing our gratitude. In addition to expressing my gratitude, I am also going to add how I sought out joy, even on my roughest of days. So, without further ado! My gratitude and joy list for Monday, July 10, 2017! This is a big one as much of my family would also be classified as friends. They provide me with history, with experience, with love, and with criticism. Even the criticism (yes, I use that word and not critique on purpose) helped strengthen me and allowed me to develop into the person I am today. My friends whom I count as family. They are there regardless. They take me for who I am, all my positives and all my negatives. They hold me when I cry and feel my world slipping away. They laugh with me until my sides feel like they are going to burst. They tell what I need to hear and not what I want to hear. They are unconditional. Water in all forms. Water I drink, the water I swim in, water that comes down as rain to water gardens and trees, water that trickles, water that rushes, water that destroys, salt water that soothes my soul. I am a water baby at heart and it brings me a peace that is only rivaled by the mountains and forests. Being able to move in nature, to find a place where all you can hear is the birds, rustling of leaves in the breeze, babbling brooks, and the ability to push my body to hike to the top and capture a view that can take my breath away is something that I can’t imagine not having the access and ability to do. This is a biggie! Being able to love myself, flaws and all, unconditionally is something I will always be grateful for. It took time to get here. But I have never been happier. My body can climb mountains and run, it can jump and skip, it can sit peacefully and read, it can process information and hug others. My body is strong and amazing. Before my flight home from D.C. yesterday, I took the time to go back to the mall and visit some of my favorite monuments and memorials. I only had an hour and a half but it brought me joy. I have been seeing more live music. While I don’t always connect to music the way some people do, when I find music I do connect to, experiencing it live blows me away. Last weekend I swam and played in the water for hours. I felt like a kid again and it was wonderful. Woah! Those are some pretty big things to be grateful for. Not everything we have to be grateful for is big, hopefully next week I can delve into some of the little things I am grateful for. That I had this time and the mere ability to read, about the rain drops on my window right now, the trees still sleeping in their foggy embrace of the early morning, the dog next to me, the crisp duvet my hands rest on while writing this. And you. And God. And that life is good at this very moment I shared with your thoughts. 🙏🏻 ……….. even I can’t find my fuzzy socks and my feet are freezing! Let there be coffee and a hot shower. 🙂 Love and Light!